Even with a minor slow down in home sales during recent months, desirable properties are still getting multiple offers. Make no mistake, we are still very much in a seller’s market. Available housing inventory ranges from low to non-existent in many neighborhoods. With low mortgage rates still pervasive and rapidly increasing home values – buyers and soon-to-be sellers are eagerly hitting the market in search of a home. It might be their first home or it might be a long awaited move-up home purchase, regardless the buyers are ready and waiting for any and all inventory to come on the market. That includes the frustrated home buyers, the ones that keep coming up a day late and a dollar short on their offers. Ever persistent, these dogged champions of the housing market are bound and determined to snag a home sooner rather than later. They keep making offers, but they keep missing the mark – losing out on their dream home to all cash buyers or to buyers that are better prepared and have a stronger offer. Stronger offers can be elusive to some. Many think it’s solely offer price that makes a stronger purchase offer, but that’s not always the case. Of course sellers love a higher offer price, but sometimes that’s not the determining factor. Sometimes the stronger offer is actually at a lower price to homebuyers that they – and/or their real estate agent – perceives to stronger and more likely to actually consummate. If you’ve lost out on an offer for a home or three you might be wondering how to avoid that situation going forward. Why are those buyers “stronger” than you? How do YOU become the strongest offer on the table without overpaying for a home? The good news is that you can be the prettiest girl (or most dapper gentleman) in the proverbial offer room. Just a few simple steps before you write that purchase offer can turn your fortune and have other would be buyers wondering – what are they doing that I’m not? In this market, if you see a home you like you’d better be prepared to jump on it. Don’t hem and haw, make the offer. More importantly, the quicker you can go from escrow to close the better. Of course, mortgages take time. Rushing your loan officer with a truncated escrow period usually doesn’t speed up the process and it always adds stress to the situation. In some cases, not allowing the proper time to close blow up the transaction and cost you thousands. Don’t do it – just don’t. There’s a right way – the only way outside of paying cash really – to cut the time needed in escrow. It’s not an insult if you get a counter-offer, it’s likely because the seller has multiple offers and wants the best deal. As I mentioned before, the best deal is not always the most money. The seller might be in escrow on their new home and have other concerns. They need their current residence – the one you’re wanting to buy – to close before they can move AND in some cases before they can get final approval on their new home purchase. It’s not unusual at all for a seller to accept a lower offer from a more qualified – or more prepared – buyer. They simply cannot afford to roll the dice and risk the earnest money they’e put down on their potential new home with a purchase contract that has an iffy buyer attached. That’s why you have to come strong if you’re making an offer. It starts with selecting an experienced team to represent you. 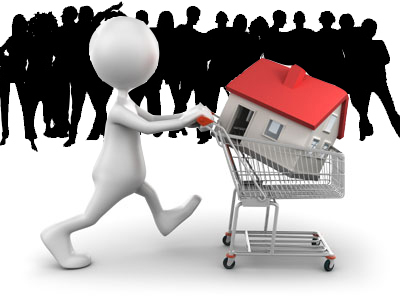 Mortgage professional and real estate agent – choose wisely and don’t make price your primary driver. Experience and quality service are huge. Work with people actively closing real estate transactions – your nephew’s girlfriend is only a good option if she’s legitimately qualified – and absolutely only work with a mortgage professional that can and will provide you with a REAL pre-approval. Some of you may not like this, but a real pre-approval requires work. There’s a documentation and time investment that starts well before you ever make a purchase offer. Not only will this step tell you how much home you can actually afford, it is a vital part of a making strong offer in a seller’s market. A real pre-approval requires all your income, asset and explanatory documents to be gathered, sorted and submitted to an actual human underwriter for an actual underwriting approval. You don’t just get validation of your qualifications, you become a better buyer. But I haven’t even found the house yet? What if I don’t find a house at all? Sorry, but this is a step the strong – the ones that you keep losing out to on your offers – buyers take. If you don’t find a house at all you will have wasted some effort gathering all the needed documentation – for sure. That said, it’s also self perpetuating. The strong, human underwritten, mortgage commitment helps you win purchase offers. Without it, you might just fulfill your own prophecy and “not find a house at all”. Be the strong buyer, do the work upfront. Period. Whether buying your first home or your fifth, doing the appropriate legwork when selecting your real estate and mortgage team along with making sure you’re properly pre-approved before you start house hunting will dramatically increase your chances of home buying success. It’ll save you a heck of a lot of stress during the process too.